2012 will be over soon, and I can't believe my blog will be one year old on January 3rd! This year has been such a crazy year full of new beginnings, and as the year comes to an end today, I've been reflecting a lot on all of the little wonderful experiences I've enjoyed since starting this blog. So, I thought I would share the top 10 projects on my blog from the first year. Here are my most my most popular projects, in order, from 2012. #2. The Striped Guest Bathroom: The picture below is the most pinned picture from my blog. When I was re-doing this room back in January, I had a wild idea to paint stripes on the little half wall, and I'm so glad I did! #3. 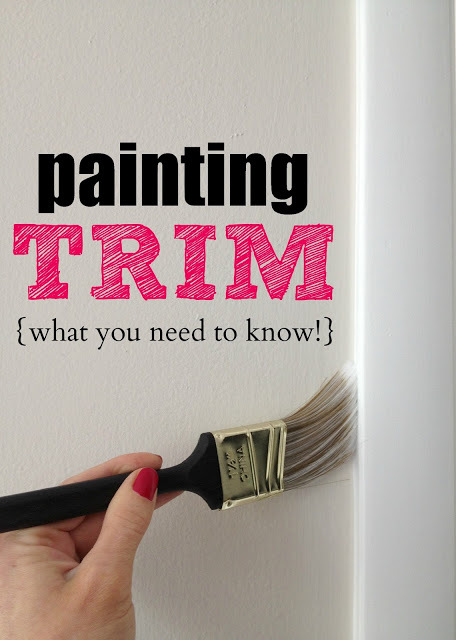 How To Paint Trim: My tutorial for painting trim has been one of my most popular posts to date, and I'm so glad. I remember how daunting painting my house seemed at first (when I had never even touched a paintbrush before), and it makes me happy to know I've been able to help others with what I learned along the way. I also included before and afters of all the rooms in the house in this post, so it's a fun read even if you have no intention of wielding a paintbrush anytime soon. #4. Our Kitchen Cabinet Chalkboard Paint: This was simply just one of my favorite ideas, so it makes me so happy to know how much you liked it. #5. 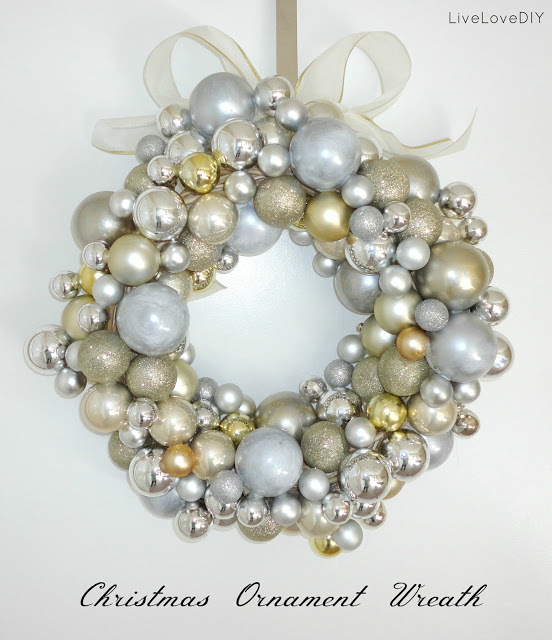 Christmas Ornament Wreath: This was by far the most popular small project I've done, and one of the most recent! I had over 30 of you send me your own versions, and I cannot even express how wonderful that made me feel! Thank you! #6: The Office Makeover: This was one of my personal favorites, as it's a room I get so much use out of. Updating this room gave me a great place to focus and create. It's also one of the only rooms that I've done and then totally left alone. I haven't changed a single thing about the decor since I finished it back in early February. #7: The Guest Bedroom: This little room was one of your favorites also. The funniest part is that this room has undergone more changes than any room in the house. I think it's because it's rarely used, and I can experiment with it without inconveniencing our day-to-day activities. This was the version 1.0 of the guest bedroom done in January 2012. #9. 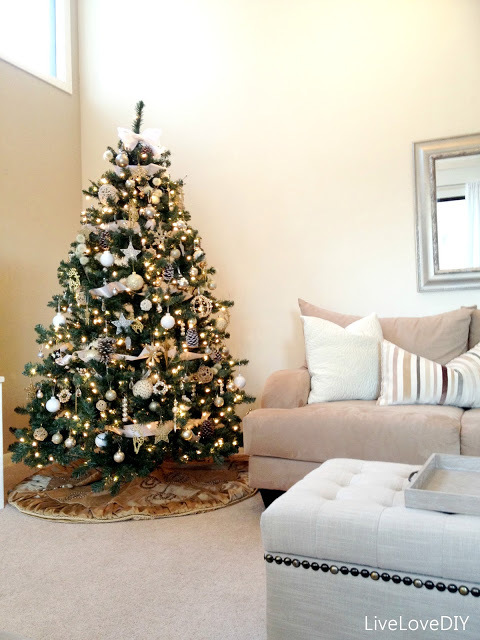 Our 2012 Christmas Tree: I loved that this post made it into the top 10, as I truly put my heart and soul into it! With a little thrift store tree, and hundreds of homemade ornaments, I was able to create a tree that I loved. #10. The Dresser Makeover: Last, but certainly not least is the dresser. When I first laid eyes upon this $50 Craigslist dresser, I knew it could be amazing with a little TLC. However, I could have never predicted how well-loved it would be by you! Nearly a year later, and it's still my favorite furniture redo! So, that's it! The top ten of 2012! It was crazy year, full of ups and downs, but I love knowing that through all of it, I was able to bit-by-bit make our house a home! I so look forward to what 2013 has to bring. Make sure to stop by Thursday, January 3rd (my blogiversary!) 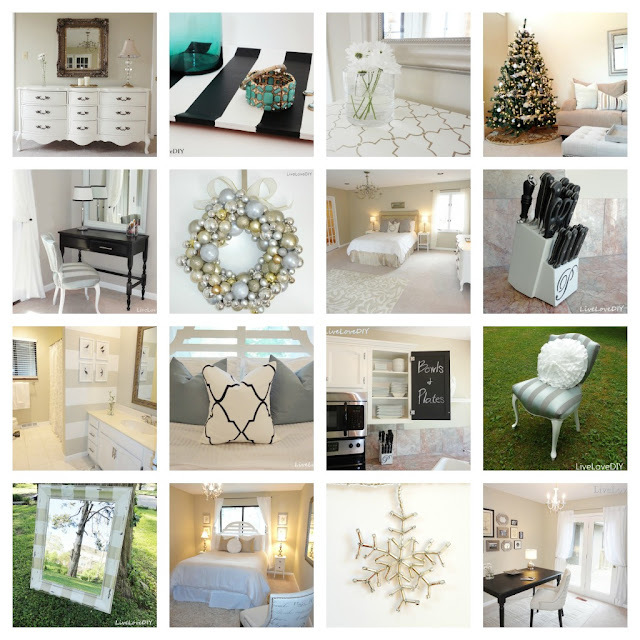 where I'll show you a few of my favorite posts from this year (they might surprise you! ), and talk about some of the things I've learned in my first year of blogging. I hope you'll join me!! Most of all, have a happy and safe New Year, and I'll see ya NEXT YEAR! Holy Hanna I am coming to stay with you! It is like a slice of Coconut Cream Pie over in your home! My gosh! Really...you think I am joking..I am looking at airfare right.now! Virginia, I can't begin to tell you how beautiful your home is! What a great top 10 list! Happy New Year to you and look I'm looking forward to seeing what you've got in store for 2013! Beautiful work and a beautiful home. Happy New Year! Everything is so lovely. I have enjoyed seeing all your projects. I think my favorites were the ornaments and tree decorations. You are so creative! Happy New Year for you. It's been a wonderful year for you Virginia, looking forward to "hanging" with you in the new year - all the best for a fabulous 2013! How fun!! All of your projects are gorgeous! I especially love the chalkboard inside the doors. GENIUS!! All are equally beautiful! I look forward to seeing what 2013 brings for us all. I'm sure it will involve some DIY'ing, that's for sure!! Thank you so much ladies (and gent!)!! It truly warms my heart to read all of your sweet words!! Happy New Year!! I found your lovely blog and just enjoyed looking around. What beautiful and awesome projects. I'm thinking I need to do some of these. LOL I am a new follower too, have a great week.